LSU's second big early-season victory has prompted the Tigers to rise to No. 6 in the Associated Press Top 25 poll released Sunday. 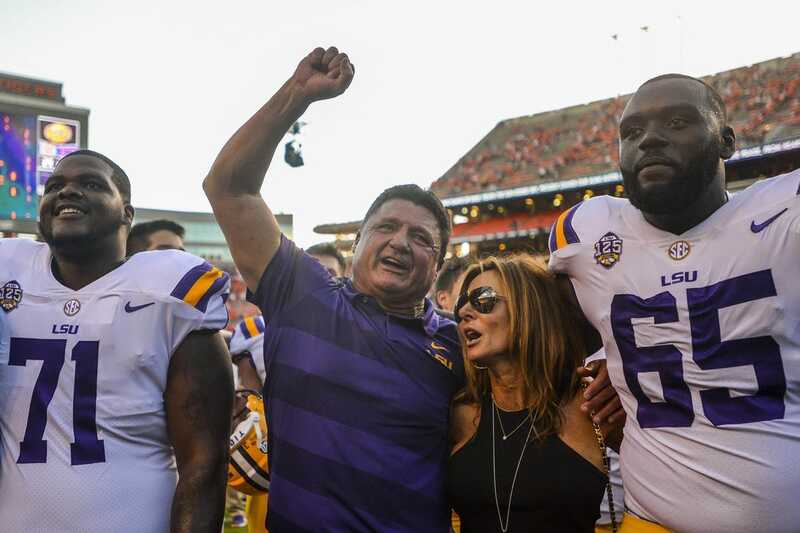 LSU moved up six spots after defeating SEC rival Auburn 22-21 on Saturday. Earlier, the Tigers opened the season with a 33-17 victory over Miami. LSU is one of four SEC teams in the top 10 and six in the Top 25. Alabama remains atop the poll, while fellow SEC member Georgia is now No. 2 after leaping Clemson. The Crimson Tide received 58 first-place votes. Clemson received the other three. Auburn (No. 9), Mississippi State (14th) and Texas A&M (22nd) are the other SEC teams in the Top 25. The Aggies are a new entrant in the poll. Ohio State (No. 4) and Oklahoma (No. 5) round out the top five. Taking a dive was Wisconsin, which suffered a 24-21 loss to BYU. The Badgers fell from sixth to No. 18, while BYU broke into the poll for the first time this season at No. 25. Stanford rose two spots to seventh, and Notre Dame remained eighth. Washington and Penn State are tied for 10th. West Virginia is 12th and Virginia Tech is 13th. Oklahoma State moved up nine spots to No. 15 after a romp over Boise State, which is no longer ranked. Central Florida is the highest-ranked team from a non-power conference. The Golden Knights are 16th. TCU dropped two spots to 17th after falling to Ohio State. Michigan is 19th, followed by Oregon and Miami. Boston College (No. 23) cracked the poll for the first time since 2008, while Michigan State is 24th. USC and Arizona State joined Boise State in falling out of the rankings. The Trojans were routed by Texas, and Arizona State lost to San Diego State.